Red Thread Adventures: Dude, Where's the Car? Having visited Mongolia last year we were impressed by the number of tiny Hyundai's and their ability to ford any stream and cross any mountain. 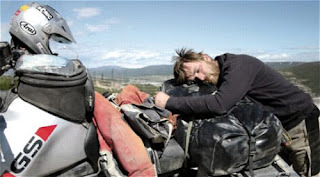 There appears to be a lesson that was learned by Charlie Boorman and Ewan McGregor in their "Long Way Round" trip. That is, if it's too big and too bulky to be moved by human power, it's not the right vehicle for the journey. Their large BMW R1150GS motorbikes were terrific on the highway, but when the asphalt petered out the heavy machines proved incredibly challenging and had to be manhandled over potholes and mud puddles. By comparison their cinematographer, Claudio von Planta's 350cc IZh Planeta 5, ran circles around them over the rough terrain. The Adventurists goal of limiting the size of the vehicle is as much to foster adventure as it is a practical limitation. Our goal, therefore, is to find something reliable enough to make it, small enough to meet the rules, and popular enough to be readily available on the secondhand market.